Growing up, Vince Moiso loved fall Saturdays. The way he saw it, Sunday through Friday was just a means to an end; a tolerable inconvenience that eventually led to the magical moment when he’d settle on the family couch and spend the day watching college football games with his father, Robert Moiso. Moiso lived and breathed the game, and just about every waking moment that didn’t involve school or chores was dedicated to honing his skills in the family’s backyard. “I played other sports, but it was always about football with me,” he recalls. When the Moiso clan relocated from Orange County, Calif., to Oregon during Vince’s high school years, he quickly became one of the top prep quarterbacks in the state. Fortunately for the USD football program, the University of Oregon — his college of choice at the time — didn’t offer him a scholarship. The Ducks’ loss was the Toreros’ considerable gain, as Moiso went on to become one of the most prolific signal-callers in USD history. After graduating from USD with a degree in political science in 1995, Moiso went on to play professional football in Europe. While his career overseas was successful, it also prevented him from making it back home to be with his father as he battled the debilitating and ultimately fatal effects of Alzheimer’s disease. Newly married, and with his wife expecting their first daughter, Moiso turned his back on football, and built a life for his young family by returning stateside. Enter the USA Network’s new reality TV show, “The Moment,” an unscripted series that follows the journey of nine people who are given a second chance to pursue the career of their dreams. Unbeknownst to Vince, he’d be playing a starring role. 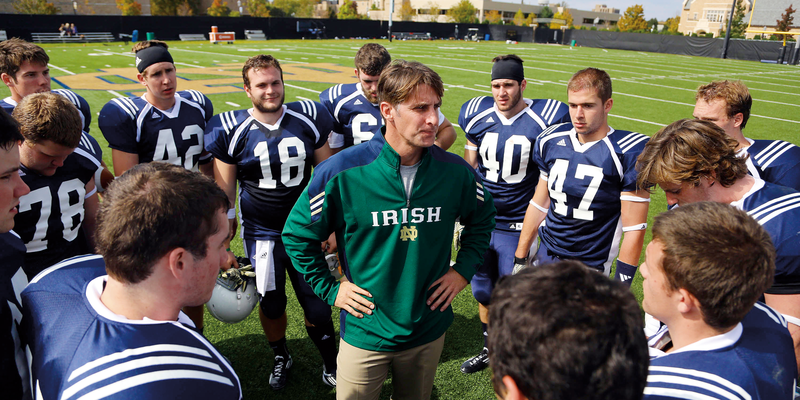 Warner, a former all-pro NFL quarterback with the St. Louis Rams, New York Giants and Arizona Cardinals, informed Moiso that he’d have the opportunity to get back into the game he loved, this time as a high school coach in South Bend, Ind. Over the course of one week, Moiso would re-immerse himself in everything from the X’s and O’s of play scripting to learning the strengths and weaknesses of his players. Along the way, he was able to identify some of his own deficiencies, including his never previously acknowledged guilt over not being at his dad’s side when he passed away. As cathartic as the experience proved to be, there was still a life-changing decision to be made. Moiso’s brief tenure as a high school football coach had been monitored closely by Notre Dame Athletic Director Jack Swarbrick, and he liked what he saw. The moment was now at hand; would Moiso accept Swarbrick’s offer to work at Notre Dame, or would the demands of his life back in San Clemente outweigh the benefits of this dream opportunity?